This image appears on the cover of the SIGGRAPH Asia 2009 proceedings. Large dense crowds show aggregate behavior with reduced individual freedom of movement. We present a novel, scalable approach for simulating such crowds, using a dual representation both as discrete agents and as a single continuous system. In the continuous setting, we introduce a novel variational constraint called unilateral incompressibility, to model the large-scale behavior of the crowd, and accelerate inter-agent collision avoidance in dense scenarios. 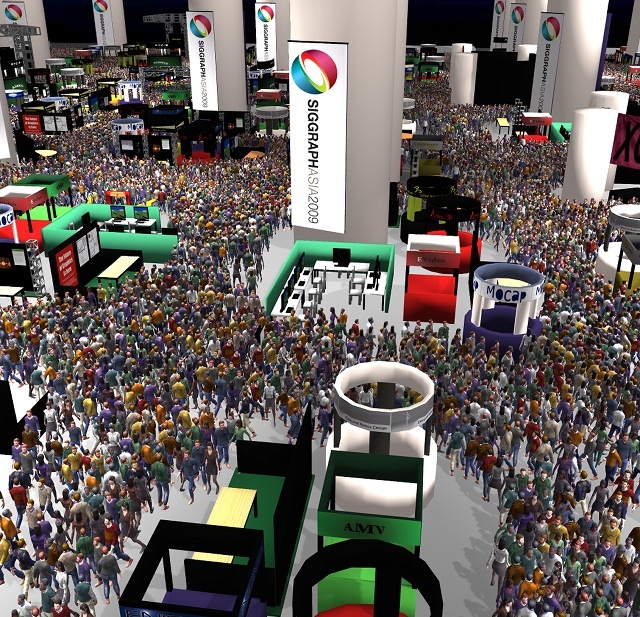 This approach makes it possible to simulate very large, dense crowds composed of up to a hundred thousand agents at near interactive rates on desktop computers. Rahul Narain, Abhinav Golas, Sean Curtis, and Ming C. Lin, 2009. Aggregate Dynamics for Dense Crowd Simulation. In ACM Transactions on Graphics (Proceedings of SIGGRAPH Asia), vol. 28, no. 5, pp. 122:1–122:8.